Nice numbers leads you through the digits that you meet in every-day life, how they came to be, and what makes them nice. Concealed behind our daily activities is a rich history of mathematics. This book seeks to introduce you to a few unexpected ventures that have been sculpted by numbers, such as the playing of games, the sounds of music, and the study of ringing bells. The journey traverses various mathematical terrains starting with simpler topics, for example fractions and decimals, then leading to more advanced ones of number theory and calculus. All throughout, there are plenty of examples, tables, and diagrams that help bring the theory to life and make the content accessible. My personal highlight is a section about how our information is securely communicated over the Internet. An algorithm known as RSA allows for safe transmission of our messages without a hacker being able to intercept and read them before they reach their destinations. John Barnes gives an overview of how this process is completely founded upon properties of prime numbers, in which their mystery is utilised as their strength. Through the use of tables and colours, he sheds some light upon its tricky technical details such as Euler's function and Euclid's algorithm. The end result is that the reader is guided, piece-by-piece, through the inner workings of RSA. This culminates in the interactive manual RSA encryption of an Internet favourite: the word "cat". Originating from a series of lectures, the book is structured so that the reader can either dip in and out of topics as they please, or read from start to finish. Questions and references at the end of each chapter also meet the needs of both those who wish to test themselves and those with an appetite to just read more. The book itself contains an enormous appendix section with further examples to allow interested readers to dive deeper into their preferred topics. The appendix on Rubik cubes even translated what I knew from mathematical theory to help me understand how to solve it, which is the reverse of how real problems usually help to understand the mathematics instead. 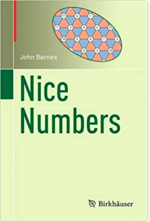 Nice numbers delivers a multi-layered experience to readers of differing mathematical knowledge. For experienced readers of mathematics (at degree level or above) the familiar concepts, notation, and formulas offer a particularly warm welcome compared with mainstream popular mathematical texts. However at first sight, this insistence to maintain mathematical formality may frighten the more casual reader. But fear not, for those who rise to the challenge are still rewarded with a conceptual flavour of the underlying theory. Understanding the concepts precedes the ability to write the daunting signs and symbols, and it is this initial comprehension of ideas that once stole the heart of all mathematicians. The versatility of this book means that it is suitable for anything between a few paragraphs' glance up to a serious level of study. Those of all mathematical abilities will be able to pick it up and find something that interests them and their level of engagement. Moreover, the content contains many worked examples to facilitate a positive learning experience. Whoever you are, after reading this book you will know more about the culture, history, and importance of some numbers in our modern-day society. In addition, you will probably start to develop a sense of which numbers you like (or dislike!). At the very least, you will gain a new appreciation of the question, "What is your favourite number?" Harry Gray is a PhD student in Mathematical Genomics and Medicine at the MRC Biostatistics Unit at the University of Cambridge. He works on statistical inference for high-dimensional data - estimating how lots of genes interact with each other when there are very few samples. He has an interest in communicating statistical concepts to lay audiences. People always laugh at me when I tell them this, math rules all !! In 2010 John Barnes published Gems of Geometry. The book was based on a series of lectures he had given on a variety of geometry topics that he finds fascinating. After fielding requests to do the same for numbers, Barnes agreed. He gave lectures on numbers and their properties at both Reading and Oxford. In 2016 those lectures were published under the title Nice Numbers. The lectures comprise the ten chapters of the book. Some of the topics are very basic, and historically interesting, such as Measures, Time, and Notations. Other chapters discuss properties of primes and the RSA algorithm. In all cases Barnes presumes little to no background knowledge. He provides all of the necessary historical or mathematical information that allows the reader to understand his explanations. Thus, the book is suitable for any reader who can do high school level mathematics and has the interest and curiosity to follow Barnes on his wide-ranging explorations. Each chapter ends with suggestions for further reading; most chapters have some exercises for the reader to attempt, although no answers are provided. The more challenging exercises are marked with an asterisk.